Row by Row is starting up in JUNE! For those of you that don't know what Row by Row is... it is a program started to help quilt shops thru the slow summer months. Participating Quilt shops register at www.rowbyrowexperience.com and the fun begins! Fat Quarters buy 2 get one FREE! We always offer 10% to anyone who shows their current Guild Membership Card and Military ID holders. We have implemented a new price structure for our sale table fabric! No longer just 25% off... we are going to a progressive markdown. So come in and check it out. A fun get together to work as a group on a project or on that one outfit or technique you have been struggling with. 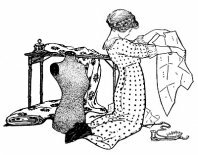 Flo will be available to help with Lace shaping, fancy bands, maderia applique, construction and SMOCKING! One on One Beginning Sewing Classes are offered by appointment. All of our classes are limited in size, so please pre-register.